In this report we studied the genetic regulation of juvenile development of wildbarley introgression lines (S42ILs) under two contrasting hydroponic nitrogen (N)supplies. Ten shoot and root related traits were examined among 42 S42ILs and therecurrent parent ‘Scarlett’. The traits included tiller number, leafnumber, plant height, leaf and root length, leaf to root length ratio, shoots androot dry weight, shoot to root weight ratio, and chlorophyll content. Our aimswere (1) to test the suitability of a hydroponic system for early detection offavourable S42ILs, (2) to locate quantitative trait loci (QTL) that control theexamined traits, (3) to identify favourable wild barley alleles that improve traitperformances in regard to N treatment and, finally, (4) to validate the identifiedQTL through comparison with previously reported QTL originating from the sameparental cross. The phenotypic data were analysed in a mixed model association study to detectQTL. The post-hoc Dunnett test identified 28 S42ILs that revealed significant(P < 0.01) effects for at least one trait. Forty-three, 41 and 42S42ILs revealed effects across both N treatments, under low N and under high Ntreatment, respectively. Due to overlapping or flanking wild barley introgressionsof the S42ILs, these associations were summarised to 58 QTL. In total, 12 QTL ofthe hydroponic N study corresponded to QTL that were also detected in field trialswith adult plants of a similar S42IL set or of the original S42 population. Forinstance, S42IL-135, -136 and -137, revealed increasing Hsp effects fortiller number, leaf number, leaf length, plant height and leaf to root ratio onthe long arm of chromosome 7H. These QTL correspond to QTL for ears per plant andplant height that were previously detected in field trials conducted with the sameS42ILs or with the S42 population. Our results suggest that the QTL we identified under hydroponic N cultivationpartly correspond to QTL detected in field experiments. Due to this finding,screening of plants in early developmental stages grown in a hydroponic system maybe a fast and cost effective method for early QTL detection and marker-assistedallelic selection, potentially speeding up elite barley breeding programs. The domestication of barley, starting about 10,000 years ago , led to a multitude of genotypes, which are well adapted to farming under abroad range of conditions . Besides, intensive barley breeding for over a century led to modern barleycultivars revealing a low degree of genetic diversity . One aspect in innovating modern breeding programs is the introduction ofexotic germplasm into new varieties . The mlo powdery mildew resistance is a prominent example for theintroduction of favourable wild barley alleles into elite barley varieties . In this regard, Tanksley and Nelson  established the advanced backcross (AB) quantitative trait loci (QTL)approach in tomato, by which exotic germplasm is introduced into modern cultivars andQTL are characterised in the AB populations. A further approach to detect QTL withexotic germplasm is described by Zamir : the establishment of lines that carry single chromosomal introgressions fromexotic donors, so called introgression lines (ILs). In comparison to AB populations, thegenetic background of ILs is fixed to the recurrent elite parent. Thus, a complete setof ILs represents the entire donor genome on the background of the recurrent parent.Compared to other mapping populations like recombinant inbred lines (RILs), ILs offer ahigher statistical power and allow the detection of small QTL effects . Within the last years, IL sets were developed for important crop specieslike maize , wheat  and rice . In barley, von Korff et al. crossed the German spring barley cultivar ‘Scarlett’ (Hordeumvulgare ssp. vulgare, Hv) with the Israeli wild barleyaccession ‘ISR42-8’ (Hordeum vulgare ssp. spontaneum,Hsp) to develop the BC2DH population S42. By further backcrossingof population S42 with ‘Scarlett’ and subsequent marker assisted selection,a set of wild barley introgression lines (S42IL) was established . 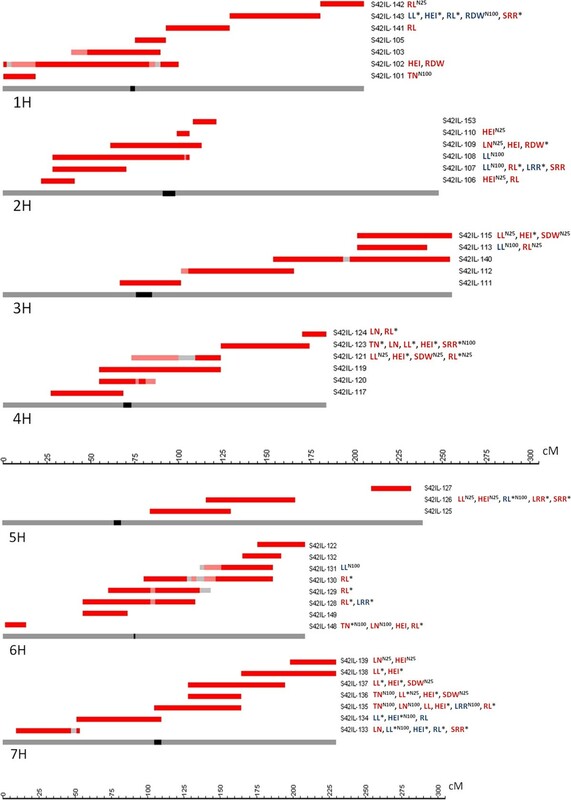 Different S42IL sets were used to locate Hsp QTL that regulatepathogen resistances, flowering time, agronomic performance, malting quality and droughtstress tolerance [14–18]. Afterwards, the S42IL population was subjected to high-resolution (HR)genotyping with an Illumina 1536-SNP array and the threshability locusthresh 1 was located on chromosome 1H by means of high-resolutionmapping with segregating offspring of the original S42IL . Nitrogen (N) is one of the nutrients plants need in high quantity . Therefore, it is necessary to understand plant stress responses to Ndeficiency including changes in growth, development and differentiation. Various QTLwere found in field trials and greenhouse experiments with barley under N deficiency,e.g. in recombinant inbred lines (RILs) . Also wild barley has been used to identify favourable alleles under Ndeficiency. In population S42 Saal et al. identified 14 QTL with reference to N supply. For instance, the authorsmapped a QTL on the long arm of chromosome 7H that caused an effect on adult plantheight across both N treatments. Later on, Schnaithmann and Pillen  mapped QTL for chlorophyll content and N content in the same region ofchromosome 7H within the S42IL population. The plant response to N deficiency affects plant growth and development and is a crucialcomponent of yield . One major problem in studying the interaction between plant growth and Ndeficiency is the uncertainty of the soil N supply in the field . An alternative approach is the examination of N deficiency under controlledconditions in hydroponic systems. Although research on plants under N deficiency hasbeen carried out in hydroponics [25–27], little is known about the direct comparison between data from single cropplants under N stress in a hydroponic system and the crop performance of the samegenotype in field trials and greenhouse experiments. For instance, Beatty et al. reported that barley genotypes studied under field and hydroponic conditionsshowed similar growth and nitrogen used efficiency characteristics. They assumed thatusing less-variable growth environments is another way to gain knowledge about traitsand genetic targets related to N nutrition. So far, a genome wide QTL analysis with aset of wild barley ILs, focussing on these questions, has not been carried out. In our study, juvenile wild barley ILs were grown in a hydroponic system under twocontrasting N treatments. By conducting the hydroponic experiments, we aimed to (1) testthe suitability of our hydroponic system for early selection of favourable S42ILs, to(2) detect QTL in the S42IL population that contribute to the control of juvenile plantgrowth, to (3) find favourable wild barley alleles that improve trait performanceseither across both N treatments or under low N supply and, finally, to (4) compare theQTL results of our experiments on juvenile barley plants with QTL found in field trialsand greenhouse experiments with adult plants of the S42IL and S42 populations and otherQTL studies. Our investigations on juvenile barley plants in a hydroponic system were carried outwith introgression lines (ILs) of the population S42IL. The S42ILs are derived from across between the German spring barley (Hv) cultivar ‘Scarlett’and the Israeli wild barley (Hsp) accession ‘ISR42-8’. Advancedbackcrossing with ‘Scarlett’ and marker assisted selection with SSRsresulted in the development of a set of 59 S42ILs in BC3S4generation as described in Schmalenbach et al. . Based on genotypic data with 636 informative SNPs  we selected 42 representative S42ILs with target introgressions located onchromosomes 1H to 7H (Figure 1). The recurrent parent‘Scarlett’ served as the control genotype in the hydroponic experimentsconducted. SNP map with 58 significant ( P<0.01 ) QTL effects among 42 S42ILs and ninetraits. The chromosomes 1H to 7H are indicated as grey bars. Thecentromeric region is indicated as a black box within the chromosome. The cMpositions of the SNP loci are indicated with the ruler at the bottom, accordingto Schmalenbach et al. . The extent of the target Hsp introgression of each S42ILis given above the respective chromosome. Homozygous Hsp loci,heterozygous Hsp loci and loci without SNP data are presented in red,pink and light grey, respectively. The associated QTL effects are indicatedright to the introgressions with abbreviations of the nine traits, i.e. TN, LN,LL, HEI, SDW, RL, RDW, LRR, SRR. Trait abbreviations are explained in Table2. The colour of the abbreviations indicates anincreasing (red) or decreasing (blue) Hsp effect. Highly significant(P < 0.001) associations are highlighted with an asterisk. Traitassociations that were only detected under one treatment are labelled with N100 or N25 , respectively. Juvenile barley plants were tested during two years in six hydroponic experiments attwo locations of the University of Halle. In 2008, one and two experiments werecarried out under low and high N supply, respectively, in a glasshouse at theexperimental station ‘Kühnfeld’, Halle. In 2011, the sameexperimental set up was repeated in a second glasshouse at the experimental station‘Heide’, Halle. In each of the six experiments, an accumulation tank forthe nutrient solution was connected to three boxes for plant cultivation (Figure2). On each of the three boxes, a perforated tray was placedcontaining 140 holes to hold the single test plants. The outer perimeter of the traywas filled with 44 non-measured ‘Scarlett’ plants in order to reduceborder effects in the box due to inhomogeneous light and space availability. Theremaining 96 holes were split into two blocks of 48 holes. ‘Scarlett’,the spring barley cultivar ‘Barke’ and the 42 S42ILs grew in four, twoand one replications per block, respectively. The plants were completely randomisedwithin each block. Hydroponic system. A. The utilised hydroponic system included anaccumulation tank for 200 l of nutrient solution that was connected to threeboxes for plant cultivation. B. 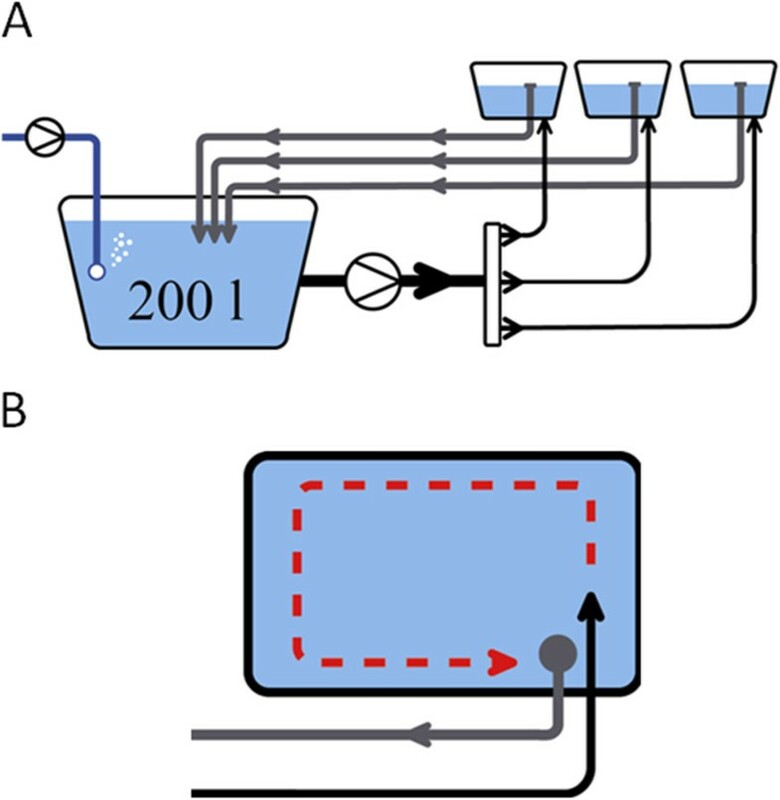 The nutrient media circulatedpermanently between the boxes and the tank, ensuring that within and betweenboxes all plants were exposed to the same nutrient composition. During the experiments, the nutrient solution circulated between the boxes and theaccumulation tank. The composition of the modified Hoagland solution [Hoagland andAmon 1950, cited in 20] is shown in detail in Table 1. Toensure that the nutrients in the solution were available to the plants the pH and ECvalues of the solution were measured daily. If the pH deviated from 5.8 ± 0.25,it was adjusted by adding 4 M KOH or 4 M HCl, respectively. Plants were grown underhigh and low N supply solutions with 2.0 mM (i.e. 100% N = N100) and 0.5 mM (i.e. 25%N = N25) of NO3-, respectively. Cultivation of the plantslasted for 14 days in the hydroponic system with 16 h photoperiod, an irradiance of300 μmol m-2 s-1 and day and night temperatures of24°C and 16°C, respectively. To ensure that the roots received an amplesupply of oxygen, air bubbles were constantly pressed with an air pump into thetank. a 2-(N-morpholino)ethanesulfonic acid (MES) adjusted to pH5.8. For each experiment, seeds of ‘Scarlett’, ‘Barke’ and theS42ILs were coated with the fungicide Abavit UF® (BASF, Ludwigshafen). Seedgermination and plant cultivation is shown in detail in Figure 3. To study the plant growth and responses to N deficiency on juvenilebarley plants, ten traits were investigated. The methods of trait measurements andtrait abbreviations are given in Table 2. Seed germination and plant cultivation. A. Barley seeds weregerminated in the dark at room temperature. B. After 72 h, seedlingsthat had three to five roots of 1.5 to 2.0 cm length and that had not yetstarted to extend the shoot were selected. Each seedling was inserted into a1.5 ml reaction tube (Eppendorf, Hamburg) that was cropped at the bottom.C. The tubes with the seedlings were subsequently plugged into theperforated trays and placed on top of the boxes. D. Throughout theexperiments the roots plunged into the nutrient solution whereas plant shootsgrew on top of the tray. a SPAD 502 meter: Minolta Camera Co., Osaka, Japan. where V G , V GxT , V GxE ,V GxTxE and Vε are the variance componentsgenotype, genotype by treatment, genotype by experiment, genotype by treatment byexperiment and the experimental error, with t, e and rbeing the number of treatments (t = 2), experiments (e = 6) andreplications within an experiment (r = 6), respectively. Variance componentswere calculated with the VARCOMP procedure in SAS. To calculate phenotypic correlations between the ten traits within a treatment and,in addition, within a trait between the two treatments, first the least squares means(LSMeans) were estimated for each S42IL with the MIXED procedure in SAS (see below).Subsequently, Pearson correlation coefficients (r) were calculated using theSAS procedure CORR. where μ is the general mean, G i the fixed effect ofthe ith genotype (42 S42ILs plus ‘Scarlett’),T j is the fixed effect of the jthtreatment (N100 and N25), L k is the random effect of thekth location (Kühnfeld and Heide),E l (T j ) is the randomeffect of the lth experiment (1 to 6), nested within the jthtreatment, B m the random effect of the mth box(1 to 18), G i × T j isthe fixed interaction effect of the ith genotype with the jthtreatment, G i × L k isthe random interaction effect of the ith genotype with the kthlocation and εn(ijklm) andεn(iklm) are the error terms of thephenotypes Y ijklmn andY iklmn , respectively, calculated from nreplications (2 to 8) per box. where for each trait the LSMeans were calculated across both treatments or separatelyfor N100 or N25, respectively. Table 3 indicates the trait performances of the S42ILpopulation for ten studied traits in regard to the parameters mean, minimum, maximum,standard deviation (SD), coefficient of variation (CV) and heritability(h2). The values of each parameter are given across treatmentsand separately for the high and low N treatment. The high N treatment evoked anincrease in the mean, minimum and maximum of the S42ILs for all traits except forroot length. The highest CV was observed for root dry weight with 45.2% across both Nlevels. On the contrary, CVs for leaf length, plant height and chlorophyll contentwere below 20% across and within both N levels. Five traits showed higherheritability across treatments than per treatment, e.g. plant height with 80.8%across treatments versus 78.6% and 60.1% for the high and low N treatment,respectively. Of all investigated traits, root length showed the highest heritability(85.2% across N treatments). On the contrary, chlorophyll content was the trait thatrevealed the least heritability (0.0%, within N25). a Trait abbreviations are given in Table 2. ALL: across treatments, N100 and N25: high (100%) and low (25%) Nsupply. e Minimum and maximum trait performance. g Coefficient of variation in %. Pearson correlations between N treatments N100 and N25 were significant (P< 0.05) for all traits (diagonal in Table 4). Highlysignificant (P < 0.001) correlations between treatments were observed forthe length traits leaf length, plant height, root length and both ratio traits. Thehighest correlation coefficient between treatments was found for root length(r = 0.70), whereas the correlation between N100 and N25 within tillernumber was weak (r = 0.32). b Significant correlation coefficients are indicated with *P < 0.05, ** P < 0.01 and *** P <0.001. When comparing the correlation matrices of both N treatments, pairwise correlationsamong traits showed a higher number of significant (P < 0.05)correlations within N100 (31, upper right triangle in Table 4)compared to N25 (24, lower left triangle in Table 4). Forexample the correlation between tiller number and plant height was highly significantat N100 (r = 0.49 with P < 0.001) but absent at N25 (r= 0.08 with P > 0.05). The highest correlation coefficients were foundbetween traits that belong to the same trait complex like leaf length and plantheight (r = 0.90 within N100) or root length and leaf to root ratio(r = -0.89 within N100). No correlation was found between tiller numberand chlorophyll content (r = 0.00 within N100). The trait leaf to root ratioshowed the lowest number of significant correlations to the other traits. Onlycorrelations to root length and shoot to root ratio were significant within N100. With regard to the trait heritabilities, QTL detection was carried out for all traitsexcept for SDW (ALL and N100) and CC (ALL, N100 and N25), revealing traitheritabilities below 10%. In total, the post-hoc Dunnett test revealed 126significant (P < 0.01) line by trait associations for nine traits.Fifty-six associations (44%) were highly significant (P < 0.001). Aspresented in Table 5, 43 associations were found acrosstreatments (Model 1), 41 under N100 and 42 under N25 (Model 2), respectively.S42IL-143, -133 and -135, with target introgressions on chromosomes 1HL, 7HS and 7HL,respectively, revealed the highest number of trait associations (twelve, ten and tenassociations, respectively). b Chromosomal location and extent (in centiMorgan) of the targetintrogression according to Schmalenbach et al. .
c Significant (P < 0.01) line effect acrosstreatments (ALL), under high N treatment (N100) or under low N treatment(N25), determined by the Dunnett test. d Least squares means of the S42IL and 'Scarlett', respectively.If the S42IL showed a significant association across treatments, the LSMeansacross treatments (ALL) is given. If the S42IL showed a significantassociation solely in N100 or in N100 and N25, respectively, the LSMeans ofN100 is given. If the S42IL showed a significant effect solely under N25,the LSMeans of N25 is given. e Difference between the LSMeans of the S42IL and the LSMeans of'Scarlett'. f Relative trait performance of the S42IL compared to 'Scarlett',calculated as RP(IL) = 100 × [LSMeans(S42IL) –LSMeans(‘Scarlett’)]/LSMeans(‘Scarlett’). Highlysignificant (P < 0.001) trait associations of a QTL are labelledwith an asterisk. g Corresponding QTL in S42 or S42IL published in: I von Korff etal. , II Schmalenbach et al. , III Wang et al. , IV von Korff et al. , V Saal et al. , VI Schnaithmann and Pillen , VII Naz et al. .
h Candidate genes published in: 1 Franckowiak and Konishi 1996,cited in , 2 Chen et al. , 3 Laurie et al. , 4 Yan et al. , 5 Faure et al. , 6 Laurie et al. , 7 Chloupek et al. , 8 von Wettstein 1993, cited in , 9 Li et al. .
With regard to the position and extent of the corresponding target introgressions,all associations were summarised to 58 QTL. Among the nine traits, root length, plantheight and leaf length showed the highest number of QTL effects (twelve, eleven andten QTL, respectively). On the contrary, root and shoot dry weight were the traitsthat revealed only three and two QTL effects, respectively. For 43 QTL (74%), theHsp allele showed an increasing trait effect compared to‘Scarlett’. In the following paragraphs, the results shown in Table 5 are described in detail for each of the nine traits. A total of five S42ILs showed significant line by trait associations for tillernumber (TN). The associations were summed up to four QTL, located on chromosomes 1H,4H, 6H and 7H. At QTn.S42IL-4H the line effects were detected across treatmentswhereas the other QTL showed only effects under N100. All QTL were due to a highertrait performance of the S42IL compared to ‘Scarlett’, with a maximumincrease of 0.5 more tillers per plant (30.7%) by S42IL-123 across treatments(QTn.S42IL-6H). For leaf number (LN), seven S42ILs significantly differed from‘Scarlett’. The effects were summarised to six QTL, which were located onchromosomes 2H, 4H, 6H and 7H. Two QTL each were detected across treatments, underN100 and under N25, respectively. At all QTL the S42ILs showed an increase in LN.S42IL-109 showed the maximum difference to ‘Scarlett’ at QLn.S42IL-2Hwith 0.9 (28.3%) more leaves per plant under N25. There were 15 S42ILs that were significantly associated to leaf length (LL). Theassociations were subsequently summarised to 10 QTL. Target introgressions of thecorresponding S42ILs were located on all seven barley chromosomes. Two and three QTLshowed significantly different trait performances of the S42IL solely under N25 andN100, respectively. Five QTL included lines with relatively shorter leaves thanScarlett. At QLl.S42IL-1H.b, S42IL-143 revealed the maximum decreasing effectcompared to ‘Scarlett’ under N100 with -3.4 cm (-14.3%). The Hspintrogression of S42IL-136 caused the maximum elongation of the youngest leaf with4.2 cm (18.9%) at QLl.S42IL-7H.b. The Dunnett test revealed 17 lines that were significantly associated with plantheight (HEI). Altogether eleven QTL from all seven barley chromosome were defined.One QTL effect was only found under N25. Two QTL were due to relatively lower plantheight of the corresponding S42ILs. As shown for LL, S42IL-143 revealed the maximumdecreasing effect compared to ‘Scarlett’ across treatments with -6.0 cm(-18.1%, QHei.S42IL-1H.b). At QHei.S42IL-7H.c, S42IL-126 had the maximum increasingeffect compared to ‘Scarlett’ under N25 with 4.1 cm (13.3%). Due to low heritabilities with h2 < 10% (see Table 3), QTL detection for shoot dry weight (SDW) was only conductedwithin the N25 treatment. There, four S42ILs differed significantly from‘Scarlett’. The effects were summarised to three QTL, which were locatedon chromosomes 3H, 4H and 7H. The QTL showed an increase in trait performance of theS42ILs revealing an up to 58.2% higher SDW. A total of 16 lines showed significantly different root lengths (RL) compared to‘Scarlett’. The associations were summed up to twelve QTL, located on allbarley chromosomes. Three QTL effects, on chromosomes 1H, 2H and 3H, were only foundunder N25. At QRl.S42IL-5H the strongest decreasing QTL effect was found forS42IL-126 under N100 with -6.7 cm (-20.8%). S42IL-121 showed the strongest increasingQTL effect at QRl.S42IL-4H.a with a 7.2 cm (21.4%) longer root compared to‘Scarlett’. Three S42ILs showed significant line by trait associations for root dry weight (RDW).According to this, three QTL were defined, located on chromosomes 1H and 2H. AtQRdw.S42IL-1H.b the line effect was solely present under N100. This QTL caused alower trait performance of S42IL-143 compared to ‘Scarlett’, with adecrease of -12.3 mg (-28.4%). The maximum increase was found at QRdw.S42IL-2H with aplus of 14.2 mg (41.9%). For leaf to root ratio (LRR), four S42ILs differed significantly from‘Scarlett’. These effects corresponded to four QTL, located onchromosomes 2H, 5H, 6H and 7H. QLrr.S42IL-7H was only detected under N100. The QTL onchromosome 5H, QLrr.S42IL-5H, was the only one with an increase in the traitperformance by 0.2 (24.1%). S42IL-107 showed the maximum decline compared to‘Scarlett’ at QLrr.S42IL-2H with -0.2 (-23.7%). A total of five S42ILs showed a significantly different trait performance from‘Scarlett’ for shoot to root ratio (SRR). The effects corresponded tofive QTL, located on chromosomes 1H, 2H, 4H, 5H and 7H. QSrr.S42IL-4H was onlydetected under N100. All QTL revealed an increase in trait performance of the S42ILs.S42IL-143 showed the maximum increase compared to ‘Scarlett’ atQSrr.S42IL-1H with 1.0 (35.1%). Due to low heritabilities with h 2 < 10% (see Table3), no QTL detection was carried out for chlorophyll content(CC). In 2008 and 2011, a set of 42 introgression lines was tested in six hydroponicexperiments under two different N treatments. The fixation of the plants in Eppendorftubes during growth in the hydroponic system allowed us to analyse shoots and rootssimultaneously. Huang et al. , who used a similar plant fixation in their hydroponic system, alsohighlighted the flexibility of those systems. Also other studies reported that plantresponses to low N availability vary among genotypes, developmental stages and plantorgans . Regarding the N treatments, we did not observe any symptoms of starvationon the plants under full supply condition, which indicates that the macro and micronutrients were sufficiently supplied throughout the experiment . In contrast, the reduction of N supply caused a severe reaction in mosttraits studied. For example, root length was increased while plant height wasdecreased under N deficiency (Table 3). Taking the parameter heritability as a quality measure of genetic to phenotypicvariation, we found that the phenotypic data collected in our hydroponic systempredominantly revealed strong and medium heritabilities with h2 >70% for five traits and 70% >h2 > 30% for two traits,respectively. Shoot dry weight (ALL and N100) and chlorophyll content (ALL, N100 andN25) have to be considered as not heritable with h2 > 10% (Table3). In this regard, the mixed model analysis of variance wasnot carried out for the respective treatments of those traits. For the other traits, the phenotypic data collected from the hydroponic experimentswere subsequently analysed in a line by trait association study. 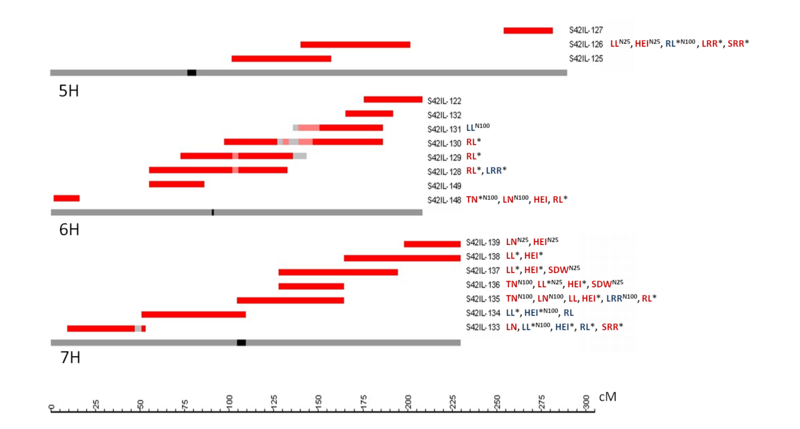 In total, 12 out of58 QTL effects (21%) that we found with juvenile S42ILs in the hydroponic systemcorresponded to QTL for comparable traits that were detected in previous field andgreenhouse studies with adult plants of a similar S42IL set or with the original S42population (Table 5). The corresponding QTL predominantlycontrolled the traits plant height (8 x) and, to a lesser extent, tiller number (1 x)and root length (1 x). Both findings, the medium to strong heritabilities observedand the high amount of corresponding QTL, support the idea to use the hydroponicsystem for early mapping of QTL and early selection of the QTL-bearing genotypes inplant physiology experiments and in plant breeding. In the following paragraphs, we discuss the detection of juvenile plant growth QTL inwild barley ILs in general and in regard to N deficiency. Finally, we will drawconnections between our QTL results, candidate genes and previously describedQTL. The major advantage of growing juvenile barley plants is the fast collection ofphenotypic data, for instance within 14 days in our hydroponic system. This time-,cost- and effort-reducing aspects are of major importance for plant breeding wherethe reduction of time for phenotypic assessment can substantially improve thebreeding process because new varieties may be introduced earlier and at lowerselection costs to the market. Furthermore, the hydroponic system allows tosimultaneously study the development of barley root and shoot traits . Mattsson et al. , for instance, could show that in barley root relative growth rateincreased while root dry weight decreased at the same time. In addition, the reactionof nutrient deficiencies on barley growth has often been carried out with juvenileplants [24, 27, 35]. We also conducted a juvenile hydroponic experiment to map QTL thatcontrol barley root and shoot traits in regard to N supply. With 126 significant (P < 0.01) line by trait associations for ninetraits under study, the number of QTL detected in the hydroponics experiment washigher than in any other study that was carried out with adult plants of the S42ILpopulation. For example, Schmalenbach et al. found 65 associations for seven field agronomical traits in the S42ILpopulation. The increase in the number of associations may be attributed to thedifferent screening methods (hydroponic vs. field testing), the differentdevelopmental stages (juvenile vs. adult plants), different traits (shoot and rootvs. agronomic traits) and the varying N levels, as already reported for the S42population by Saal et al. . The highest number of QTL was found for the length parameters leaf length, plantheight and root length. The three traits showed high heritabilities of 75.4%, 80.8%and 85.2% across both treatments, respectively. Trait heritability is known toinfluence the number and the probability of detected QTL. For traits withheritabilities of h2 < 10%, Ellis et al. did not detect any QTL. The QTL we mapped were scattered across the whole genome (Figure 1). We detected the highest number of QTL effects on chromosome arm 7HL.Here, QTL were found for all traits except root dry weight and shoot to root ratio(Figure 1). In the same chromosomal region QTL effects forplant height and shoot dry weight where already described in studies of the S42IL andS42 population (Table 5). In this regard, genes located onchromosome arm 7HL may be particularly important for regulation of plant growth. At 75% of all detected QTL, the S42ILs showed increasing Hsp effects (Table5). In contrast, when studying agronomic traits with S42ILsin the field, only 47% of the detected associations showed increasing Hspeffects . Since most of the traits measured are related to a fast growth during thejuvenile phase, this finding was expected. It may be explained by the fact that thedonor of the S42ILs, the Hsp accession ‘ISR42-8’, is welladapted to survival under low nutrient supply. Those S42ILs that reveal QTL effectscompared to the elite barley cultivar ‘Scarlett’ may have, thus,contributed exotic Hsp alleles that speed up or increase juvenile growth.Under high N treatment an increase of the traits we evaluated is generallydesirable. A fast juvenile plant development is of great importance, especially when plants aregrown under field conditions. Baethgen et al. reported that the application of a high dosage of N early in the growingseason stimulated tiller formation of malting barley. However, many of these tillersdid not develop fertile ears and, thus, the extra dosage of N fertilizer was wasted.In addition, for malting barley one has to consider that a high N supply during grainfilling may be conflicting with grain quality . On the other hand, if plants are cultivated under low N supply, manytillers may also be undesirable since plants may not be able to produce ears and fillthe grains for all of the tillers. Multivariate analyse methods like the principlecomponent analysis, are important statistical tools for primary assessment of datastructure and, in addition, may support to identify the most important traits forphenotypic selection. However, our primary aim was to locate QTL early on undercontrol and N starvation conditions in a hydroponic system. Thus, the difference intrait performance of the S42ILs compared to ‘Scarlett’ was of greatestinterest to us. Due to space and time limitations, a thorough multivariate analysiswill be delayed to a follow up study where the most promising traits and, inaddition, favourable QTL alleles, will be used for genotype selection. Subsequently,the potential selection gain will be measured within the selected offspringgeneration. Twenty-five of the 42 associations we found under N25 (Model 2) were simultaneouslypresent across treatments (Model 1, see Table 5). Jana andWilen  recommended that it is optimal, when lines that are good under non stressconditions, also perform well under stress conditions. This may be of greatimportance for breeders, who do not have to conduct two parallel breeding programs,and for farmers, who do not have to select different varieties based on expected Nstress conditions. On the other hand, selection of breeding lines in stressenvironments may result in genetic gains by using adapted germplasm, especially inregard to originally low-input crops like malting barley . However, our results indicated that a number of QTL effects were not incommon between both N treatments. Sixteen and 17 QTL were solely detected under N100or N25, respectively. In one case, the direction of the exotic QTL effect wasactually opposed, decreasing leaf length under high N supply while increasing leaflength under low N supply (see Table 5, QLl.S42IL-3H.a andQLl.S42IL-3H.b, present in S42IL-113 and-115, respectively). We, thus, conclude thatit may be worth to select barley cultivars for N stress tolerance separately fromexperiments under low N and high N fertilization. Associations to tiller number and leaf number were detected across treatments, underN100 and under N25. Similar to our results, Andersen  also found an increase in the number of leaves under low N treatment injuvenile and adult plants. For leaf length, two QTL where found in the same region ofchromosome 3H. The decreasing effect at QLl.S42IL-3H.a and the increasing effect atQLl.S42IL-3H.b were detected under N100 and N25, respectively. Our results suggestthat the gene effect on reducing leaf length is reversed under N deficiency. Shootdry weight of the S42ILs was increased by up to 58.2% under N25 (Table 3), which was already observed by Marshall and Ellis  (Table 5). Regarding plant development, root characteristics are of great importance, which isespecially shown when plants are grown under stress conditions . Most root length QTL showed an increase of trait performance under N25,which may indicate that the S42ILs try to react to N starvation by increasing theircapacity to take up N from the solution. In contrast, root dry weight showed a meanreduction of approximately 30% compared to the control treatment, which was alsoshown in various other studies [28, 40], and only two increasing QTL were found for this trait. In addition,Karley et al. demonstrated in barley that trait differences between the N treatmentsincreased with advancing growth stages, except for root parameters. The authorsreported a lack of genotype by N supply interaction for root traits and assumed alimited potential for exploiting genetic variation to improve barley root performance . However, this finding is in contrast to our study, where we detected asubstantial number of root-related QTL effects. Also Naz et al. reported a severe Hsp QTL effect on chromosome 5H that is presentin a S42IL and caused an substantial increase in root biomass, both, under droughtand controlled water conditions. Unfortunately, this particular line, S42IL-176, wasnot included in the set of S42ILs that we studied under hydroponics. We did not detect leaf to root ratio or shoot to root ratio QTL solely under low Nsupply. Also Bahrman et al. did not detect variety by N level effects in the shoot to root ratio ofeight week old wheat plants. We conclude that in order to detect a change in shoot toroot ratio, plants may have to be under stress for a longer time . Because of the missing heritability for chlorophyll content we did not conduct theanalysis of variance for this trait. In our experiments genetic effects onchlorophyll content were, thus, not stable across or within treatments. This findingis in accordance with Cartelat et al. , who reported that the change in chlorophyll content was reflecting the Nnutrition status, but showed no direct association to genotype, growth stage orenvironment, respectively. As highlighted before, we revealed more QTL than in any other QTL study conductedwith the S42IL or S42 populations, indicating that new genes may have been expressedin our hydroponic study. Furthermore, comparing trait performances of coincidingS42ILs, analysed simultaneously in our study and in field and greenhouse studies [14, 23], revealed low correlations, for example between juvenile and adult plantheight (r < 0.08, data not shown) as well as between juvenile and adultnumber of tillers and ears, respectively (r < 0.12, data not shown).However, in Table 5 altogether 12 QTL for tiller number, plantheight, shoot dry weight and root length under hydroponics corresponded to previouslydetected field and greenhouse QTL for number of ears, plant height, biomass and rootlength [14, 16, 18, 22, 23, 43, 44]. It remains open if the same genes in the respective S42ILs caused the QTLeffects under hydroponic and field or greenhouse cultivation. Alternatively, it mayalso be possible that linked Hsp alleles that are present on the sameintrogression may have caused the QTL effects in the independent studies. To furtherelaborate on this question, interesting QTL effects should be narrowed down andvalidated in high-resolution offspring lines that are derived from the originalS42ILs and segregate for the detected QTL effects . In the following paragraphs, we attempt to draw connections between 12 significantHsp effects and already described candidate genes and QTL effects. Andersen  reported that juvenile tiller number is highly correlated with adult plantear number, which is also an indicator for yield potential. We mapped one tillernumber QTL on chromosome 4H that was consistent with two previously detected QTL fornumber of ears in population S42 [22, 45]. At QTn.S42IL-7H, S42IL-135 revealed a strong increase in tiller number.Ellis et al. also found a strong increasing effect on tiller number in the same regionof 7HL with barley seedlings, too. The number of leaves influences the photosynthetic capacity of the plant. Thus,growth, development and yield may be co-regulated through the control of leaf number.Cuesta-Marcos et al. estimated the number of leaves until heading in barley lines and found asignificant QTL effect nearby the earliness per se locus Eam6 [Franckowiakand Konishi 1995, cited in 46]. We also found a QTL in this chromosomal region withS42IL-109 under N25 at QLn.S42IL-2H. In addition, the Flt 2L locus,controlling flowering time and plant height, maps to the same region  and may be present in S42IL-110. Furthermore, VRN H2 andVRN H3, two major genes determining the requirement forvernalisation, map to the same chromosomal regions where we found leaf number QTL inthe S42IL population [18, 48–50]. Their influences on growth related traits [18, 51] may be due to primary effects on juvenile leaf number as it was alreadyshown for the final leaf number in wheat . We detected one decreasing and one increasing Hsp effect for leaf length onchromosome 3H under N100 and N25, respectively. Similar to this, Gregory et al. described a reduction in barley shoot length under control conditions andassociated the effect with the candidate gene for dwarfism on chromosome 3HL:sdw1[54, 55]. Saal et al. also detected two Hsp effects on total plant height under low andhigh N treatment on 3HL, but there was no difference between the directions of botheffects. Thus, we conclude that sdw1 controlled juvenile shoot developmentin our study; however, plant reaction depends on the status of N supply. Onchromosomes 5H and 7H two additional dwarfing genes are located:ari e.GP and brh1. At both loci, we alsodetected QTL for leaf length. Chloupek et al. already described that ari e.GP has pleiotropiceffects on plant growth in general, including shoot development. However, theari e.GP allele is a very rare allele in the elitebarley gene pool, making it unlikely that ‘Scarlett’ carries thisdwarfing gene. In addition, brh1 was associated with strong effects on plant height and leaf length in abarley backcross population . S42IL-133 and -134, probably carrying brh1, showed Hspeffects of the same direction on leaf length. We verified 33 QTL, previously described for adult plant height in studies with theS42 or S42IL population, with twelve lines associated to juvenile plant height (Table5). In addition, we found candidate genes influencing barleyshoot development, which may explain the Hsp effects. On chromosome 1H forexample, S42IL-143 caused the strongest decreasing effect on plant height. QTL of thesame direction were described with the S42 population [22, 45] and the decreasing Hsp effect on adult plant height at theHvFT3 locus  on chromosome 1HL was already described . Besides, the three dwarfing genes on chromosomes 3H, 5H and 7H revealedstrong effects on plant height in our experiments. The effects are similar to thosedescribed for leaf length and are discussed in detail in the previous paragraph.Additionally, for each of the three dwarfing genes we refer to Hsp effectsdescribed in previous studies carried out with adult plants of the S42IL or S42population. On chromosome 4H, an increasing Hsp effect on straw weight was described bySchnaithmann and Pillen  which is consistent with our effect QSdw.S42IL-4H. Von Korff et al. also detected a biomass effect on chromosome 4H. Semi-dwarf genes are known to have a major impact on aerial plant organs [54, 55] but their effects on root traits was also affirmed in the literature . In this regard, Wojciechowski et al. found differences in wheat root length due to the dwarfing-geneRht. With our data, we found two contrasting root length QTL in thechromosomal regions of the barley semi-dwarfing genes sdw1 andari e.GP on chromosomes 3H and 5H, respectively. At bothloci, contrasting effects for several shoot and root parameters like stabile isotopediscrimination for C and N were reported [35, 56]. We assume that the Hsp alleles at the dwarfing-gene loci mayalso have caused the root length QTL. The number of QTL effects detected for the leaf to root ratio was relatively lowcompared to the traits it was derived from. Wang et al. demonstrated that QTL for mathematically derived traits are harder todetect than the component traits they are derived from. In general, the verification of a QTL is interpreted as the stability of its effectacross genotypes or environments. As our data suggest, the verification of a QTL mayalso be interpreted as the stability of its effect across developmental stages. Intotal, 12 QTL effects we reported for juvenile S42ILs in the hydroponic systemcorresponded to QTL previously described in field and greenhouse studies conducted withthe S42ILs or the parent population S42. S42IL-135, -136 and -137 revealed multipleincreasing Hsp effects on the long arm of chromosome 7H. So far, we could notassociate the QTL with any candidate gene. We therefore aim for further studies withhigh-resolution populations derived from those three lines, to fine-map the QTLaffecting juvenile plant development as demonstrated in Schmalenbach et al. . Additionally, there were several interesting QTL solely detected under low Ntreatment, for example, close to the dwarfing gene ari e.GP onchromosome 5H. To conclude, our data indicate that the field performance of an adultbarley genotype may be predictable by examining its juvenile development underhydroponic conditions. Thus, hydroponic studies, in particular to select genotypestolerant to abiotic stresses, have a high potential to support modern plant breedingprograms. In this regard, future fine mapping of the detected QTL in a hydroponicsystem, by means of phenotyping the already existing HR populations, which are derivedfrom the original S42ILs, may be of great benefit both to breeders and plantphysiologists in order to speed up selection of target phenotypes. The aforementionedthree S42ILs on chromosome 7H may be excellent starting points for this endeavour. Introgression line derived from S42. We would like to express our gratitude to Andrea Lossow, Max-Planck-Institute forPlant Breeding Research, Cologne, for introducing the hydroponic system to AstridHoffmann, to Dr. Wilfried Ilse for assistance in setting up the hydroponic system inHalle and to Florian Schnaithmann for assistance in running the hydroponicexperiments. The work was funded by the federal state of Saxony-Anhalt (FKZ: 3651A/0808, PI: KlausPillen). AH carried out the experiments in 2008, performed the joint data analysis andcontributed substantially to writing the manuscript. AM carried out the experiments in2011 and performed the data analysis in 2011. KP conceived the idea, supervised theproject, contributed to data analysis and to writing the manuscript. All authors readand approved the final manuscript. This article is published under license to BioMed Central Ltd. This is an Open Access article distributed under the terms of the Creative CommonsAttribution License ( http://creativecommons.org/licenses/by/2.0), whichpermits unrestricted use, distribution, and reproduction in any medium, provided theoriginal work is properly cited.